People are still wringing their hands and scratching their heads over the stupefying rise and eventual triumph of Donald Trump. They are unable to get their heads around how he managed to rouse the rabble with a rhetoric craftily embroidered with lies and half-truths. But he is not the first. Apparently, he learnt the latest tricks of political knavery from his Russian counterpart Vladimir Putin, who has mastered the art of speaking power in such byzantine ways as to blur the line between fact and fiction. Welcome to the post-truth world. Oxford Dictionaries declared “post-truth” to be their word of the year for 2016, defining it as an adjective—“relating to or denoting circumstances in which objective facts are less influential in shaping public opinion than appeals to emotion and personal belief.” To be sure, governments have always been in the business of manufacturing consent using elaborate fictions. 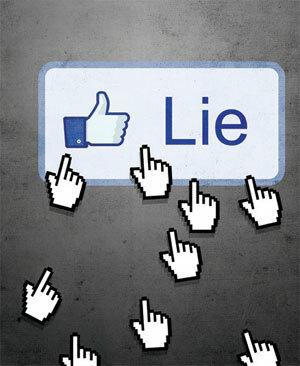 However, the rapid proliferation of the social media has taken the art of deception to a new level. Recent events like the Brexit referendum, the 2014 Indian general elections, and the US presidential elections show how popular opinion can be finessed using fake news grapevines spawned by new technologies. By the time one call’s the bluff on one lie, thousands more spring up and spread like “digital wildfires”, but often ending up in echo chambers where they only confirm people’s existing biases. Peter Pomerantsev, the Soviet-born British journalist, has observed that while politicians “have always lied…now they just don’t care whether they should tell the truth or not”. Not surprisingly, Trump has deployed the same cloak-and-dagger tactics to undermine the science behind climate change, or for that matter behind a large body of environmental laws. Calling climate change a hoax, he has threatened to pull out of the Paris climate deal. The trick is to insinuate doubt about a politically inconvenient issue in people’s minds through well-calibrated falsehoods, except that in the post-truth world, this old wine is sold in the new bottles of social media. The new strategy seems to be working, as according to a recent survey a mere 27 per cent of Americans think that over 95 per cent of scientists agree that humans are the chief agents of global warming. Indeed, the merchants of doubt have created so much cognitive dissonance that a layperson is at a loss to know what counts for valid evidence or who is a reliable expert. Alternatively, as some thinkers like Yale psychologist Dan Kahan would have us believe, this demonstrates that when it comes to issues like climate change and abortion, ideology and culture may trump facts. They argue that if the media hasn’t been able to convince climate skeptics after years of incessant messaging, what will? However, a recent study by the Cambridge University’s Social Decision-Making Lab shows that it might possible to “vaccinate” public opinion against “alternative facts” if people are given misinformation (that “there is no consensus” among climate scientists) along with its rebuttal (that there is actually 97 per cent consensus), they are more likely to fall prey to doubt than if they are were presented with fact of 97 per cent consensus alone. Meanwhile, Google and Facebook are trying to stem the rot early by nipping fake news before it goes viral by flagging it through credible fact-checkers. But many like the whistleblower Edward Snowden believes are not convinced. He believes that “critical thinking matters now more than ever, given the fact that lies seem to be getting very popular”. But for this to happen, scientists will have to get off their high horse and engage with the doubts, confusions, and, more importantly, even the “unfounded” beliefs of the lay public. As Richard P Grant, a biochemist turned blogger, recently wrote on the Guardian website, “Most science communication isn’t about persuading people; it’s self-affirmation for those already on the inside. Look at us, it says, aren’t we clever? We are exclusive, we are a gang, we are family.” That definitely needs to change if scientists want to save science from the alternative universe of Trump and his ilk. Taking out a protest march will just not do.